Picture this: You’re walking through a dark forest, late at night. There are creepy sounds all around you. Was that sound really just the wind? Why did that twig just snap? What are those glowing things in the bushes? 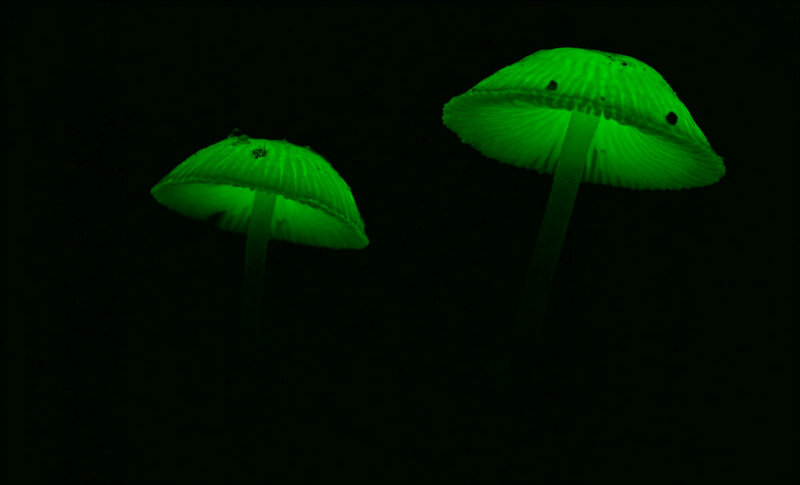 Bioluminescent mushrooms in Taman Negara National Park, Malaysia. Image by Bernard DUPONT. Well, you probably don’t need to worry too much about the glowing things. It’s more likely that you’re seeing tiny bioluminescent creatures than the Mothman. Bioluminescence is this really cool phenomenon where certain animals, fungi, plants, and bacteria can light up. This week, we’ll take a deep dive into bioluminescence – the chemistry behind it, the different types, and how it evolved in the first place. We’ll also have a look at some fascinating glow-in-the-dark critters along the way! Put simply, bioluminescence is the result of a chemical reaction, either in the organism (living thing) itself, or in bacteria living on/in the organism. The reaction occurs when a light-emitting compound called luciferin comes into contact with an enzyme called luciferase. The luciferase oxidizes the luciferin, causing it to break down. This leads to the release of light particles called photons, which we detect as visible light! Sometimes bioluminescent organisms deliberately control their light, while others flash involuntarily, depending on how complex the nervous system is. Different types of organisms have different types of luciferase specific to their species – firefly luciferase is made up of different compounds from mushroom luciferase. On the other hand, most luciferins are largely the same. In some jellyfish species like the Aequorea victoria (pictured right), this chemical reaction is replaced by a protein that produces light, also known as a photoprotein. Photoproteins produce quick flashes of light when calcium is introduced to the system. How did organisms evolve to be bioluminescent? Bioluminescent plankton washed up on a beach in the Maldives. Image by Ali Nishan. There are currently two main hypotheses for bioluminescence. The first is that the luciferase started as an enzyme meant to process oxygen in ocean-dwelling species (oxygen production is a side product of the luciferin/luciferase reaction). As life spread into deeper and darker waters, light would have become a useful tool (think of anglerfish, for example). The other main hypothesis is that the luciferin/luciferase reaction helps protect marine species from potentially harmful forms of oxygen found deep in the ocean. In many species, bioluminescence is also known to be due to symbiotic bacteria that live in or on the larger organism. Certain kinds of squid host large colonies of bioluminescent bacteria that help the squid attract food or fool predators, which also keeps the bacteria healthy and safe. Whatever the case, the fact remains that bioluminescence evolved separately over 40 times in evolutionary history – a surprisingly high number for such a specific and spectacular phenomenon. And while the highest numbers of bioluminescent species are found in the ocean, there are plenty that live on land. So it must be useful for something right? It turns out that bioluminescence has many uses, and is used in wildly different ways by different species. What’s the purpose of bioluminescence? Uses of bioluminescence fall into 3 major categories: communication, deception, and illumination. Fireflies are perhaps the best-known bioluminescent animals. How many of us spent muggy summer evenings trying to catch those cute flashing beetles? Female fireflies attract mates by quite literally flashing them. Some plankton species like dinoflagellates bioluminesce to attract the attention of large predators that will eat or chase off small predators that pose a threat. Several types of jellyfish and sea stars take the opposite approach; they use bioluminescence to warn predators away (in the same way that black and yellow stripes warn birds away from wasps and bees). Because the oceans are so huge, and contain so much life, scientists speculate that bioluminescence is actually the most common form of communication on Earth! About 76% of all deep-sea species are bioluminescent. Glow worm threads are used to lure in prey. Image by Markrosenrosen. Bioluminescence can also be a useful tool to lure in prey. Here in New Zealand, we have a type of fungus gnat that lays its eggs in caves and on the undersides of logs. The larvae make silk that dangles below them and glows blue, which attract tiny bugs. When the silken thread catches something, the larva reels in their dinner. The hungrier the larva is, the brighter the glow. 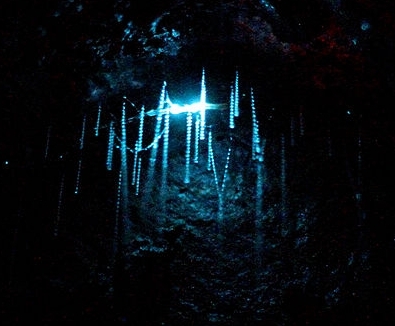 There are several popular tour businesses that take visitors to caves full of these glow worms. The anglerfish also uses its light-up lure to attract prey, mimicking the glow used by other deep sea creatures to communicate or attract mates. Bioluminescence can also be used for trickery in defense – squid use blue bioluminescence so their undersides match the color of the ocean surface above them, as does the cookie-cutter shark. I don’t mean to overstate the obvious, but it’s pretty dang dark at the bottom of the ocean. A group of fish known as dragonfish use their bioluminescence in much the same way that humans use flashlights. Interestingly, dragonfish are thought to be the only fish that glows red – most marine creatures produce blue or green bioluminescence. The red light gives the dragonfish a distinct advantage when it comes to hunting: they can see species with red coloration, which are rendered virtually invisible in the low light conditions of the deep ocean. 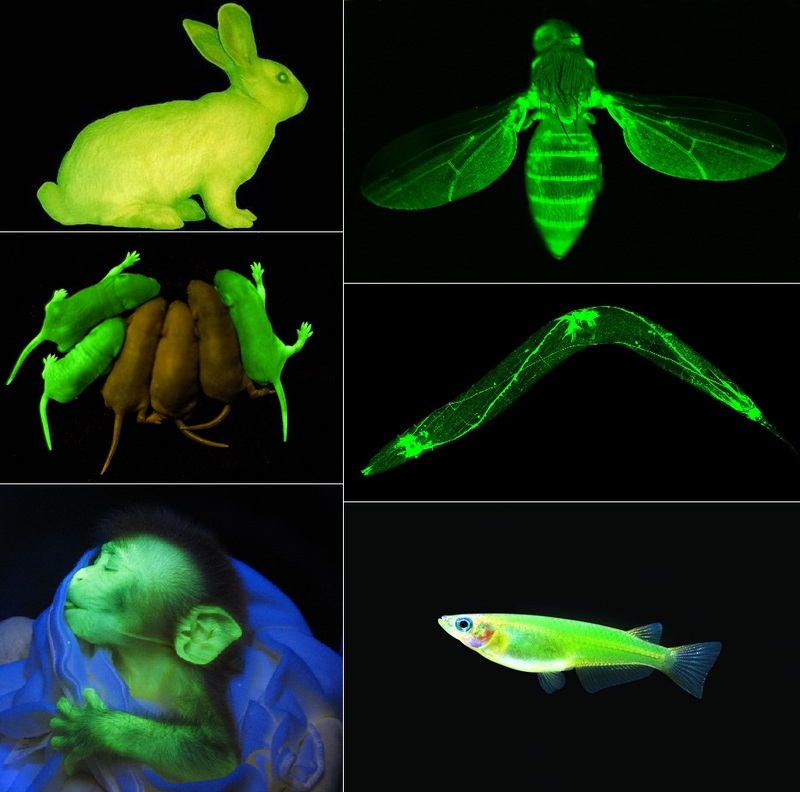 Some examples of animals with the GFP gene added to their DNA. Image from wondreal.blogspot.com. Humans have also made use of bioluminescent creatures. Before the invention of the safety lamp, dried fish and jars of fireflies were used to light up coal mines in Europe (to avoid having an open flame around flammable materials). More recently, the discovery of green fluorescent protein (better known as GFP, taken from bioluminescent jellyfish) has revolutionized the field of molecular biology. It’s used as a genetic marker, so scientists know if their alterations to genes worked or not. Of course, you also get side effects like glow-in-the-dark mice, but hey! Scientific progress for the win. Happy Halloween from the Wild Focus Project!! !